Celebrate the return of "Game of Thrones" for its final season with the Mother of Dragons cocktail available at Eureka for a limited time. In honor of the final season of "Game of Thrones," CraSh Lounge will offer themed cocktails including the White Walker. In honor of the final season of "Game of Thrones," CraSh Lounge will offer themed cocktails including The Wall. In honor of the final season of "Game of Thrones," CraSh Lounge will offer themed cocktails including the Red Wedding Punch. Planning your "Game of Thrones" season premiere party? Pick up a bottle of Johnnie Walker’s new limited-edition White Walker available at Sully's locations at Stockdale and Coffee, Ming and Buena Vista and Coffee and Olive. Celebrate Houses Stark, Lannister or Targaryen as well as the Night King with limited-edition Oreos. The Shake Shack in Madison Square Park in New York City is offering for a limited time only the Dracarys burger and the Dragonglass shake. The battle for the Iron Throne and, more importantly, for the fate of Westeros is upon us. "Game of Thrones" returns to HBO Sunday for its final season. Helping fuel you through the super-sized episodes, which will reach 80 minutes before the May 19 series finale, are some drinks and snacks that might tame the Dothraki horde. Bakersfield is lucky to have some local libations created just for us in tribute of the long-running HBO series. 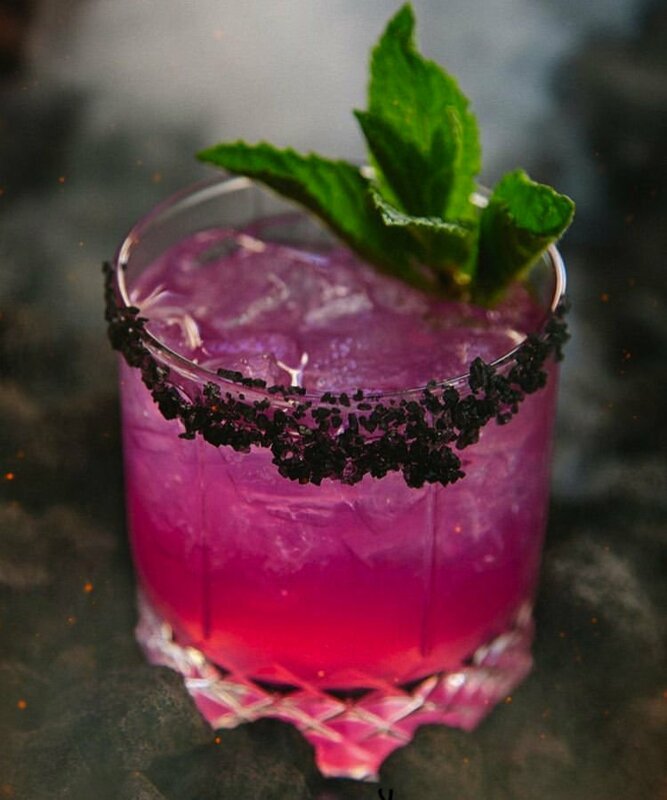 At Eureka, order the Mother of Dragons, created by bartender Torie Sanders. Having previously made a White Walker cocktail, which she said people still order, she knew she'd have to do something special for the final season. "I immediately knew that I wanted to incorporate dragon fruit as a play on Daenery’s character and her dragons," she wrote in an email. "The unique, vivid color of dragon fruit compliments the strong will and powerfulness of the character in the show so I had my heart set on it." Sanders said the drink is her take on a dragon fruit mojito. "Using silver rum with fresh mint and lime juice gives the drink an all over fresh tropical taste while still allowing it to be boozy," she wrote. "The dragon fruit gives it that natural hot pink color, which is beautiful and delicious. The flavor is just fruity enough to add a little something extra to the classic cocktail to take it into a new realm of greatness. The black lava salt adds an intense contrast to the presentation and is a wonderful addition of flavor into the overall experience." The drink is part of the “farmers market cocktail” program, meaning it uses Eureka's existing craft bar ingredients along with something special. In this case the fresh dragon fruit for the syrup and the lava salt used to rim the glass make it a limited-edition libation available through the end of the month. A huge fan of the show — she and husband Ryan watch the show and listen to podcast reviews — she said she'd love to see a heroic victory with the Starks and Daenerys but knows that's not likely.
" ... that’s not Game of Thrones, I anticipate a lot of death and a lot of betrayal. I’m preparing to see some of my beloved characters die and I’m excited to see some awesome battle scenes." Eureka is at 10520 Stockdale Highway. Those wanting to toast the final season can also head downtown to CraSh Lounge, which will host Sunday gatherings with trivia, games and drink specials starting at 5 p.m. On the menu currently are a trio of themed drinks to tempt any would-be Targaryen. The Wall is frothy with egg whites combined with gin, lime, simple syrup and mint. Make a statement with the Red Wedding Punch, a mix of bourbon, lime, elderflower liqueur and cranberry. Or take on a White Walker, a cocktail of rum, lemon juice, simple syrup and cream soda. Bartender Neil Swank said other themed drinks may make the cut as the season goes on. CraSh is at 1810 Eye St. If you're having your viewing party at home, consider a stop at Sully's for a bottle of Johnnie Walker’s new limited-edition White Walker whisky. The bottle reveals hidden designs when it’s chilled. The whisky is available at three Sully's locations: Stockdale and Coffee, Ming and Buena Vista and Coffee and Olive. And keep an eye on Cornerstone Bakery's Facebook and Instagram. For the last week, the 19th Street bakery has been posting images offering a glimpse of a "Game of Thrones"-themed custom-order cake. The reveal is expected Sunday, after the lucky customer has picked it up and whisked it off to a viewing party (or some other celebration). Earlier this month, Oreo announced a special line of "Game of Thrones" cookies stamped with sigils of House Stark, House Targaryen and House Lannister. There's a fourth creepier option with the Night King. The treats are available at some Target and Walmart locations and on the chain's websites. Mountain Dew also held a promotion offering fans “A Can Has No Name.” The white cans appear blank until chilled, then revealing Arya Stark's kill list. The promotion run through Twitter was limited to 800 cans. Finally, lucky fans in New York City have the chance to order from the secret GoT menu at the Shake Shack in Madison Square Park. They can enjoy a Dracarys burger (two patties topped with bacon, Monterey Jack and a spicy sauce of scallions, hot sauce and herbs) and a white chocolate mint Dragonglass shake topped with shards of dragonglass (a combination of toffee, food coloring and butter created by the Shake Shack’s Innovation Kitchen). The burger will be served through April 21, the shake through May 19 or while supplies last. Early customers were asked to order in Valyrian; the burger is "drakaro parkliapos" and the shake is "zīrtom perzomy rholītsos."